The Pan American Health Organization/World Health Organization (PAHO/WHO) Office in Haiti, the Centre d’Information et de Formation en Administration de la Santé (Center for Information and Training on Health Administration – CIFAS) of the Haitian Ministère de la Santé Publique et de la Population (Ministry of Public Health and of the Population – MSPP) and BIREME/PAHO/WHO developed a technical cooperation activity with the objective of strengthening health information and knowledge management in the country. This activity took place after the visit of Dr. Diego González, Director of BIREME, to the country last April. In that occasion, Dr. Luis Felipe Codina, PAHO/WHO Representative in Haiti, CIFAS Director, Dr. Fréderic Barau Dejean, the Minister of Health, the directors of the main medical schools in the country and the Director of BIREME agreed to form the Haitian Virtual Health Library Network, as well as to develop capacities on information management and scientific communication. The training included three workshops which took place between June 19 and 22, in Port-au-Prince. It brought together around 40 professionals, including librarians, medical doctors, medical residents, consultants and managers of public and private health institutions in Haiti. All the activities took place in the facilities of the PAHO/WHO Office in Haiti. 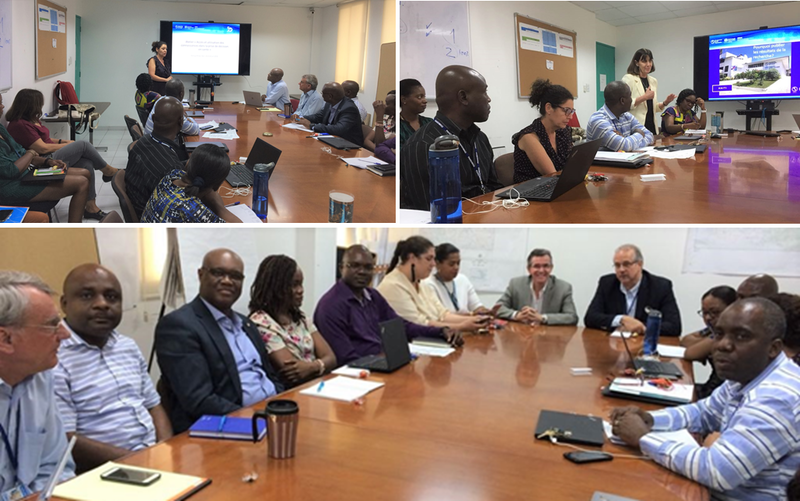 Dr. Lilian Calò, BIREME/PAHO/WHO Coordinator of Scientific Communication, taught the Scientific Communication course, addressed to medical professionals, researchers and academics, with the aim of informing about the main concepts on scholarly communication. Scientific writing per se was one of the topics covered by the program, which included aspects of the editorial process, journals and their management, the role of editors and reviewers, peer review, ethical aspects, evaluation of journals and impact indexes, as well as an introduction to the current trends and state of the art of scientific communication, such as open data, predatory journals, preprints, and post-publication peer review, which form the basis of what is known as open science. Verônica Abdala, Manager of Information Sources at BIREME/PAHO/WHO, facilitated two workshops: a) Health information management and b) Access and use of information for decision-making in health. The first workshop was addressed to librarians and the second was for librarians and health professionals. 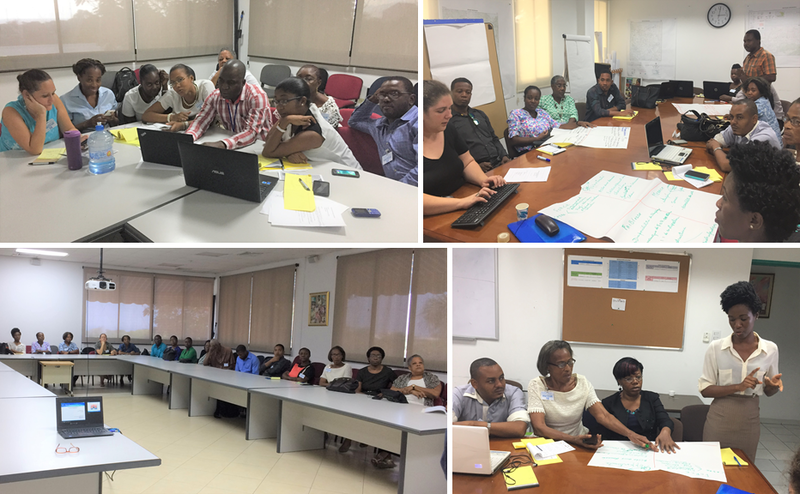 The workshop for librarians had as its main objective presenting the proposal of creating a Haiti VHL and developing a database for registering the country’s scientific and technical output in the health area. The VHL Model was presented to the group, as well as the Methodologies offered by BIREME to reach the desired objective, which depends largely on the creation of the Haitian Health Library Network and of a strong capacity development program for information and knowledge management. Professionals from five Haitian libraries participated in the workshop and the content that was shared was new to them. The group elaborated a SWOT matrix (Strengths, Weaknesses Opportunities and Threats) to evaluate the country’s conditions, considering BIREME’s proposal. During the workshop, lines of action were elaborated to build a work plan that will allow organizing a cooperation network, defining responsibilities, developing capacities for information management and the actions needed to achieve two main products: the Haiti VHL and the country’s bibliographic control. The workshop on access and use of evidence for decision-making in health was addressed to the entire group – librarians and health professionals. The VHL was presented as the main source for information search. Practical work was prioritized and three of the country’s most important problems were addressed: tuberculosis, maternal mortality and infant and neonatal mortality. First, the group searched for evidence to identify the magnitude of each problem in the country. Next, a new search for evidence was carried out (systematic reviews) to find possibilities of addressing the problem. Defining lines of action for a work plan that takes into consideration the formation of the Haitian Health Information Network; carrying out bibliographic control of the country’s literature based on the expansion of a CIFAS database; development of capacities within the Network for the management of health information in the country. Extension of the use of the VHL at the national level, considering that nowadays there are few Haitians who know about the VHL. It also includes the promotion on using HINARI in the country. Development of synthesis of evidence for the nine priority health problems of the country, which goes beyond the development of knowledge showcases, since they consider intervention options and assess necessary arrangements for the implementation of the options, always considering the context of the country. According to PAHO/WHO Representative in Haiti, Dr. Luis Felipe Codina, “the alliance between BIREME, CIFAS/MSPP and PAHO/WHO Haiti, which made these workshops possible, will ensure that individuals and health professionals in hospitals, clinics, health centers and communities will have access to the best evidence available to guide the treatment of diseases and to the base the creation of public policies. Dr. Fréderic Barau Dejean, Director of CIFAS/MSPP acknowledged the presence of BIREME professionals and stated “it has always been an aspiration of CIFAS to acquire knowledge on scientific communication, access to information and management of databases. This is a training for future trainers, because we intend to replicate the knowledge acquired”. 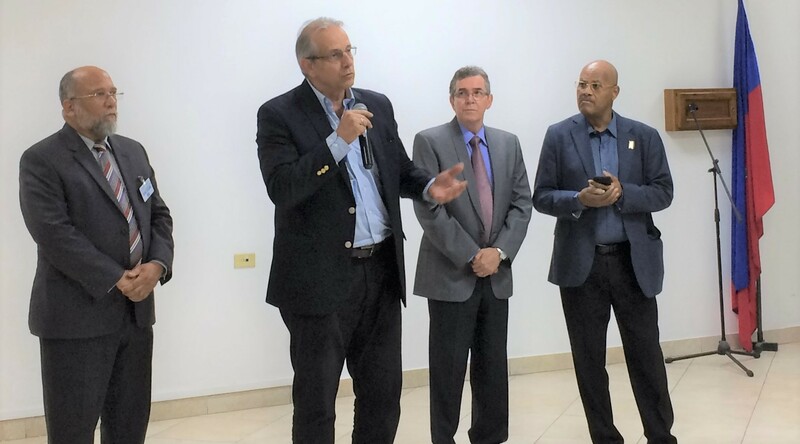 Dr. Claude Suréna, who represented the Minister of Health at the opening of the event, acknowledged BIREME’s presence and all the work that PAHO/WHO carries out in the country and expressed the importance of promoting access to information for health decision making. Considering what Dr. Dejean said, BIREME rendered available, in French, all the material used in the workshops, including presentations, exercises and scientific writing guides. The HINARI program, created by WHO in partnership with leading scientific publishers, enables low and middle-income countries to access one of the world’s largest collections of biomedical and health literature.